Hatch Art Project inaugurates our first exhibition with, Deciphering Foods: You are what you eat. This group exhibition will feature bold, raw and critical works by emerging artists from Asia Pacific region: They are the Bakudapan Food Study Group (Indonesia), Deborah Loh aka Wondebra Loh (Singapore), Iqi Qoror (Indonesia), Jazel Kristin (Philippines), Nguyễn Văn Đủ (Vietnam), Shim Hyejung (Korea) and Yaya Sung (Indonesia). Bakudapan Food Study group's "Cooking with pressure" presents a series of drawings highlighting the dire food scarce situation which the survivors of the Indonesian Communist Purge faced in 1965. Nguyễn Văn Đủ's "Slaughter House" presents a series of works, some literally painted in animal's blood, of the slaughtering of animals he witnessed in Vietnam. A reminder that the blood is on our hands from eating the animals that were sacrificed. Shim Hyejung's "Kimchi" narrates how a simple and traditional food can build a sense of attachment through the taste of it. While Wondebra Loh unravels the hidden meanings behind the food advertisements she used in her works. Yaya Sung's "Parade of Buts" explores the relationship of the feeling of being fearful, the human body and edible substances. Iqi Qoror presents the concept of misleading knowledge in food. A food has its own wisdom and the wisdom depends on how well we can understand food itself. It is dependent on the prior knowledge we have and the experiences we had with food. Last but not least, as food is connected to memories, Jazel Kristin's works not only remind her of the food she had consumed but how food also "consumes" her. 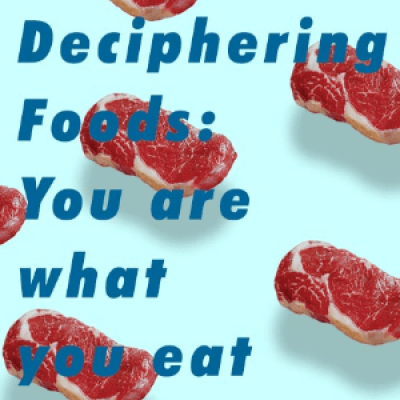 Deciphering Foods: You are what you eat opens on the 4th June till 3rd August 2018 at Asia Square Tower 1, 8 Marina View, #01-02.